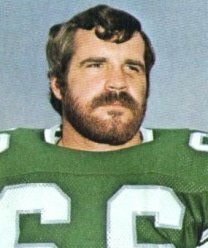 Former Eagles linebacker Bill Bergey will be honored by the Philadelphia Sports Writers Association with its 2010 Philadelphia Living Sports Legend Award at the PSWA’s 107th annual banquet on January 31st, 2011. With the Eagles, Bergey was voted into four Pro Bowls in seven seasons as an Eagle and was named Eagles MVP three times, once making 233 tackles in a single season and setting the NFL record for most single season interceptions by a linebacker. Bergey helped the Eagles back to the playoffs in 1978, 1979 and to the Super Bowl in 1980. He retired in 1981 and was inducted into the Eagles Roll of Honor in 1988. The Sports Writers Association’s 107th annual banquet will be held on Monday, January 31st, 2011 at the Crowne Plaza Hotel on Route 70 in Cherry Hill, N.J. In addition to the Living Legend award, other awards to be presented will be the Team of the Year (Philadelphia Flyers), professional and amateur Athletes of the Year, Humanitarian, Good Guy Athlete, Native Son, Outstanding Penn Relays collegiate performer, MVP of the Army-Navy game, and several special achievement presentations. For more information, contact John Weber at (267) 408-7500. Visit www.pswa.org or friend us on Facebook.